Heed these 10 beauty commandments to start every day feeling fresh and looking beautiful. As tempting as it is to crash the moment you get in from working or partying, you risk waking up with a crusty face smeared with mascara and a stained pillow. Always take two minutes to remove the day’s make-up before you get into bed. Make it easy for yourself by leaving wipes in your bedside draw. 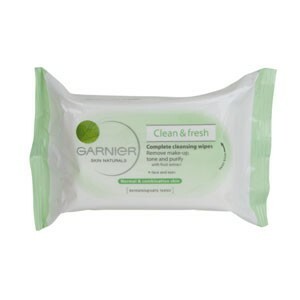 Try Garnier Clean and Fresh Wipes for just £2.17 for a vitamin-enriched clean. Skin can become dry and scaly after showering. Avoid the problem by massaging towel-dried skin with an all-over body moisturiser. Try Nivea Rich Nourishing Body Moisturiser for £3.56. Never underestimate the power of a good eye cream to banish those bags and leave you feeling fresh-eyed. Try No 7 Perfect and Protect to delay the first signs of ageing around your eyes for £15. Beautiful things can be achieved with a little blending and shading. Create contours and shadows by using your finger or a brush to blend two different eye-shadow shades together. Try this 5 piece brush set by Models Own for £10. The big secret to healthy, shiny hair? Heat protection. It’s those pesky straighteners that cause fly away hairs and frizz, so spray your hair liberally with heat protection before you get to work. Try this ultra healthy Organic Root Stimulator Olive Oil Heat Protection Serum for £4.39. We all know how quickly hair can grow back and it’s no fun getting caught out with a three-week stubble. Keep on top of your legs, bikini line and underarms with a good hair removal product. Try Veet Hair Removal Cream (with aloe vera and vitamin E) for £7.99. Unless you’re outside in the middle of winter, there’s no hiding your nails. Keep them looking beautiful by applying a strengthening varnish regularly. Try the Sally Hansen Diamond Strength Instant Nail Hardener with real diamond particles for just £8.99. Don’t let beauty come at a price. When outside, always protect from skin cancer and ageing with an SPF face cream. Try Origins A Perfect World Age Defence Moisturiser with white tea extracts and SPF 25, for £35. Did you know dirty make-up brushes can cause infections and irritations? Dirty brushes can also change the colour of your eye-shadow. Keep yours clean by washing them in warm, soapy water and leaving them to dry in a cool dark place such as a cupboard. Variety is the spice of life. Keep your beauty regime up-to-date and exciting by changing things up and trying new things. Never get yourself into a beauty rut. Find new colours, new brands, new styles – just keep experimenting!